← Ahhhh! This garden is just right! Picking some of these red beauties for breakfast on a hot summer day…good morning! Inspired? I hope so! Growing raspberries is not rocket science. If you want them, grow them! Here’s what I did. I found an area that gets at least 6 hours of sun during the growing season. I had a good spot along our driveway, near the apple trees. I created a sheet mulch bed (wiki does a pretty good job describing the process) approximately 3′ x 20′ right on the lawn in the early fall for ten plants and let it sit there all winter long. If you decide to sheet mulch, I would suggest using a digging fork through the area before creating the bed. Push the fork straight down and push back and forth just so that the lower layers of the soil can receive water and oxygen. It isn’t hard or time consuming and will give you an idea of what the soil is like under the grass. I used what I had available for the layers. From bottom to top, I layered cut green stuff (even weeds! ), horse manure, cardboard, compost and manure and leaf mulch and straw. Raspberries like just a little acidity in the soil…pH 6.5-6.8. Amendments can be made at the base layer. The top layers should be relatively weed-free and you should water each layer well. If you do that anytime now until fall; there will be sufficient time for decomposition of the layers and for soil life to build. I ordered my plants in the fall for delivery in the spring. It’s good to order your plants early so that your chosen variety isn’t sold out. (Looking back at receipts; Nourse sent my order the week of March 28, 2011 and I got the bare root plants right in the ground upon receiving them.) I want to give Nourse a plug because they have been an excellent resource. Good prices, reliable service, a large variety of healthy plants, and a great website which is full of information. They have an excellent guide for growing raspberries. However, it is up to you to decide which variety to put in your space. Not easy. I chose Taylor raspberries which are fruiting now. They are summer-bearing; meaning that the fruits are growing on the second year canes. When it is time to prune these plants; I will cut away the canes that have fruited this year and leave only the new canes. Next year they will fruit while new canes sprout up. They take a little more attention but that has not been difficult for me. I like to prune. I also have Jaclyn raspberries which are fall-bearing (also called “ever-bearing”). They will begin fruiting later this summer. In that way, we spread out our raspberry-ing pleasure. All the canes of the fall-bearing plants can be cut to the ground during pruning time. You can possibly get two crops if you prune them as summer-bearing but it isn’t highly recommended. You’ll get stronger fruiting by leaving it to one crop. I have read this but haven’t, actually, run the experiment. When you get your plants; follow Nourse’s instructions (even if you did not purchase from Nourse…it is a very good guide). You don’t want to plant these deep. I made a furrow and planted them out 2′ apart. You will get fall-bearing fruit the first year but summer-bearing plants won’t fruit until the following year on the 2nd year canes. I’ve not had to fight with birds or squirrels yet so have not caged or netted them. We did put up a sturdy but simple trellis with wire which seems to work well. There is an illustration in the guide from Nourse. I have found that allysum borders a raspberry row very nicely. It is an easy annual, often self-seeds, and is great for beneficial insects. I, also, have a bunch of tansy growing near one end. This article tells about tansy’s benefits as a companion plant as well as a couple other of my favorite plants: yarrow and lovage. Tansy is supposed to deter cucumber beetles, Japanese beetles, and squash bugs. I do have to thin it out occasionally because it will crowd the area and it spreads. Just recently, I dried the tansy and used it in the bedding for the chickens. It can serve as an insect repellant. This entry was posted in Edible Landscaping, Food, Organic gardening, Uncategorized and tagged jaclyn raspberries, Raspberry, tansy, taylor raspberries. Bookmark the permalink. 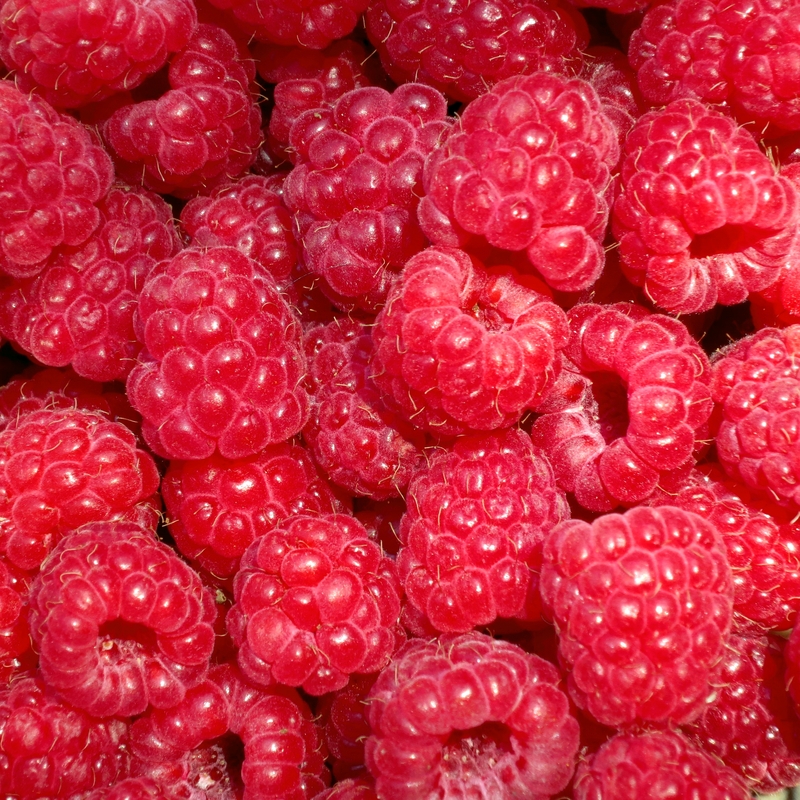 These raspberries look absolutely divine! They are photogenic! AND delicious! Michaelann, My sister sent me an article from the newspaper(Inquirer, dated June 8th) and I just had to send you a reponse. I grew up in West Philly and now live in Round Rock,Texas. I have lived in Texas some twenty odd years and the growing condition have proved a challenge. I love to garden and have been doing so since I was a young child. I recently closed a business that allowed me a large side yard where I had a raised bed vegetable garden and some chickens. I moved the chickens to my home and decided to put my vegtable garden in my front yard. My back yard has little room left after all of my flower beds. My husband likes a green lawn and has put up resistance to a vegetable garden in the front yard. However, here in Texas during a drought and my lack of interest to waste water on a lawn, I have prevailed in my quest for my vegatable garden. The article about your front yard came at just the right time. Raised beds and container gardening is the way to go in parts of Texas. I am using railroad ties and very large recycled landscaping installation tree tubs. I recently came across a method of contained gardening you my be interested in. It is called KEY HOLE GARDENS. It was developed by a non-profit group to aid underprivialge countries(Africa) in growing food for their families. Google Key Hole Gardens for the method or look at the video on youtube. Send a Cow is the non-profit group.